Where are the drain lines? Where are the drain lines? One of the biggest challenges of any drainage project is making it look as if the project never took place. Nobody likes to see droughty drain lines for years after the completion of a project, especially not Brian Schwiehofer at Franklin Hills C.C. in Franklin, MI (just outside of Detroit). Anyone that has ever visited Brian’s course would vouch for his attention to detail, and 50,000 feet of visible drain lines would not have been acceptable in Brian’s world. Any project can suffer from some wilted lines during prolonged dry stretches, particularly in the first couple of years after the completion of the project. Here at Turf Drainage Co. of America, we have witnessed millions of feet of material installed at the top courses in the country, and we have never seen a project look better than this one. Visiting the project six months after the completion, we can honestly say that over 80% of the lines were undetectable, even to someone who knew exactly where each line was installed. 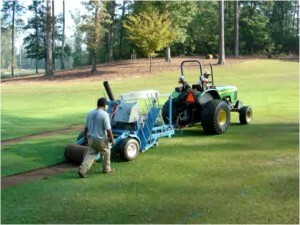 Even the other 20% were so well done that the golfer would not realize there had been a drainage installation. Phase 2 will begin at Franklin Hills in September of this year, and we look forward to working with Brian and his crew again. We hope that if you visit Franklin Hills in the future, you won’t be able to tell we were there. 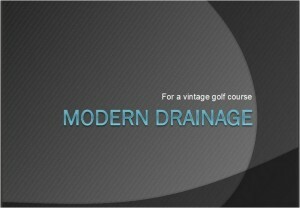 Brian has been kind enough to let us link to the his presentation, “Modern Drainage for a Vintage Golf Course,” which he gave at the Michigan Turfgrass conference this past winter.